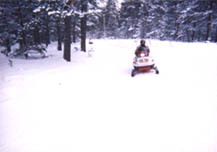 The Michigan DNR is responsible for maintaining the Michigan snowmobiling trail system. They spend over 2.5 million dollars to groom the trails each year. These funds come from registration and trail permit fees. Eleven regional offices and 100 grooming machines are in use during the season to maintain the trail system. Be sure to check if Electric Snow Shovels are available to use around any hotels you rent for the snowmobile season. Snowmobilers must register their machines wih the Secretary of State. The registration is good for 3 years and costs $22.00. State law requires that you affix the registration decals issued to the snowmobile to each side of the forward half of the cowl above the footwell.